President Obama had his health care summit yesterday, inviting Senators and Congress persons from both parties to put their ideas on the table; and the results were predictable. The Dems and Obama explained why our health care system is broken, why individual mandates and subsidies are necessary to fix it, and why banning pre-existing conditions without mandates will not work. The Republicans prattled on about interstate insurance, health care accounts and high-risk pools. And the Democrats explained why none of those will do anything to reform the system and will cause insurance costs to sky-rocket. The good news was that there was very little nonsense about “death panels” or socialism, although Republicans stuck to their goal of misleading the public by bleating about government take over of health care, abortion subsidies, and strong arm Democratic tactics. If we had a rational public discourse in this country, the debate about health care would be over and we could expect overwhelming public support for the Democratic plan. But we don’t have a rational public discourse, in part, because the press will not report what is actually happening. Although the Democrats rightly emphasized how many Republican ideas were in their proposal, anyone who listened closely or who has been following this year-long debate knows that Republican demands to start over are a thinly disguised attempt to derail any reform. They have one goal, which they have stated explicitly, and that is to make sure the Democrats don’t get credit for another policy that will help people. But you will not hear the Washington Press corps tell it like it is. And 30 second clips on the nightly news are likely to show the “reasonable” Republicans pleading for bi-partisanship, giving the casual viewer the impression that the mean Democrats are up to their old arrogant tricks. I suppose we have made some progress. Opponents can no longer claim their ideas have not had a fair hearing, and the Democrats have put health-care reform back on the agenda. Democrats need to stop timidly worrying about Senate decorum, use the reconciliation process, and pass the damn bill. Via Brian Leiter, The Atlantic lays out the disturbing long-term consequences of our current recession and the failure to provide adequate stimulus to the economy—both, by the way, the consequences of a conservative ideology that may be back in power in 2010. Who better to put out a fire than an arsonist? [I]n fact a whole generation of young adults is likely to see its life chances permanently diminished by this recession. Lisa Kahn, an economist at Yale, has studied the impact of recessions on the lifetime earnings of young workers […] She found that, all else equal, for every one-percentage-point increase in the national unemployment rate, the starting income of new graduates fell by as much as 7 percent; the unluckiest graduates of the decade, who emerged into the teeth of the 1981–82 recession, made roughly 25 percent less in their first year than graduates who stepped into boom times. When Kahn looked more closely at the unlucky graduates at mid-career, she found some surprising characteristics. They were significantly less likely to work in professional occupations or other prestigious spheres. And they clung more tightly to their jobs: average job tenure was unusually long. People who entered the workforce during the recession “didn’t switch jobs as much, and particularly for young workers, that’s how you increase wages,” Kahn told me. This behavior may have resulted from a lingering risk aversion, born of a tough start. But a lack of opportunities may have played a larger role, she said: when you’re forced to start work in a particularly low-level job or unsexy career, it’s easy for other employers to dismiss you as having low potential. Moving up, or moving on to something different and better, becomes more difficult…. The article goes on to provide evidence that people who don’t establish themselves in the job market within two years tend to suffer long-term psychological and physical damage that continues to inhibit their careers even if they eventually find steady work, suffering from increased rates of alcoholism, depression, mortality, and apathy. I hope things turn around before our students hit the job market. Posted by Dwight Furrow in Culture, Dwight Furrow's Posts. Since the advent of new computer and network technologies, commentators have been worried that the “web” was changing our intellectual abilities, distracating us with superficial facts in short bursts of information, rather than engaging with lengthy analyses that require focused thought and longer attention spans. Via Ars Technica, The Pew Internet & American Life project polled 895 Internet experts to see what they thought of such doom-laden prophecies. Peter Norvig. Google’s Research Director, not surprisingly, defends the merits of skimming, saying that it sets the stage for more prolonged mental effort. As to whether people want to make that effort, it remains up to them. Dean Bubley, wireless industry consultant, says that the Web is merely the extension of a process that has been going on for millennia: using technology to free up our minds for other tasks. Andrew Nachison, cofounder of We Media, argues that access to so much digital knowledge might be edging out other kinds of knowing, leaving us to drown in a sea of facts. Nick Carr. Carr sticks to his guns. It’s not that IQ scores are going down, but that the change in mental activity promoted by long exposure to Google and the Web has real problems. As someone who engages in focused, lengthy analysis for a living I can’t say the new technologies have influenced my cognitive “style”. But the real danger I suppose is that these technologies could influence our reading preferences. If we get “intellectual payoff” from short bursts of information will we want to engage in deeper analyses anymore? On the other hand, we may lose patience with lengthy stories or analyses that don’t repay the effort. This may make us less willing to invest the time in authors with no track record. New writers may have difficulty getting noticed. This post is quite long. Congratulations if you made it to the end! Unemployment is high, stubbornly high, and many economists, including Administration economists, think the employment situation will not improve quickly. Allen Sinai is no left wing academic—he has been for many years a prominent forecaster of economic trends for major corporations and governments. The idea that capitalism will destroy itself by seeking efficiencies that will ultimately throw the people who buy its products out of work was one of Karl Marx’s main ideas. Now it is being confirmed by the capitalists themselves. New research in neuroscience continues to have important implications for philosophical debates in ethics and political philosophy. Political philosophers interested in abstract debates about equality vs priority and sufficiency should find this recent study in Nature Neuroscience of interest (as well as this News piece). ‘Social value orientation’ characterizes individual differences in anchoring attitudes toward the division of resources. Here, by contrasting people with prosocial and individualistic orientations using functional magnetic resonance imaging, we demonstrate that degree of inequity aversion in prosocials is predictable from amygdala activity and unaffected by cognitive load. This result suggests that automatic emotional processing in the amygdala lies at the core of prosocial value orientation. This is important research in support of an ethic of care and its political implications. It suggests that our concern for fairness and equality is rooted in the emotions, not in our capacity to reason impartially. 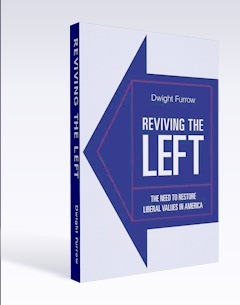 It supports my main argument in Reviving the Left. I am giving a talk on Friday for our Occasional Lecture Series at Mesa College. It is open to the public so if you are interested in politics, ethics, and their intersection (and you live in San Diego) check it out. The talk will be on Friday at 12:00 noon in LRC (Library Resource Center) 435. This is indeed madness but what would you expect given that the mad are in control of our media and our political discourse? The allegedly grass roots “tea party” movement has gotten lots of attention recently. Is it something new? A populist uprising against the establishment? A political force to be reckoned with? It may be a political force but it is nothing new. A new CBS/Times poll does an in depth study of the movement. It is for the most part made up of conservative Republicans and conservative independents whose viewpoint is well to the right of most Americans; and it is a much smaller movement than the press has led us to believe. 18% of Americans identify themselves as Tea Party supporters; 55% say they know little about the movement. Since 62% view the GOP favorably and only 9% view the Democrats favorably, it is safe to say it is overwhelmingly made up of Republicans and a few independents. 80% have an unfavorable opinion of President Obama. They are more likely than other Americans to oppose bank regulations, and less likely to blame the Bush Administration for budget deficits. Almost 50% believe, contrary to fact, that Obama has raised taxes. They are, for the most part, conservative Republican voters, who have always been vocal and attracted lots of attention—but they now have a catchy new name. Posted by Nina Rosenstand in Nina Rosenstand's Posts, Philosophy, Philosophy of Human Nature, Science. I am always optimistic when I hear that a new Philosophy of Everything is making its debut. Why not? Why should the time of the great system builders be over? Let’s have some sweeping new thinking, to go hand in hand with the rapid expansion of the natural sciences. (Douglas Adams does deserve credit for at least trying.) And when I ran across Robert Lanza’s theory of Biocentrism in the Huffington Post recently, I thought I’d be in for a fun time. Robert Lanza is an interesting scholar; he’s been working with stem cell research and cloning, and is willing to explore radical new ways of thinking. But this article wasn’t nearly as much fun as I’d hoped for. Immanuel Kant declared in 1781 that space and time were real, but only indeed as properties of the mind. These algorithms are not only the key to consciousness, but why space and time − indeed the properties of matter itself – are relative to the observer. But a new theory called biocentrism suggests that space and time may not be the only tools that can be used to construct reality. At present, our destiny is to live and die in the everyday world of up and down. But what if, for example, we changed the algorithms so that instead of time being linear, it was 3-dimensional like space? Consciousness would move through the multiverse. We’d be able to walk through time just like we walk through space. And after creeping along for 4 billion years, life would finally figure out how to escape from its corporeal cage. Our destiny would lie in realities that exist outside of the known physical universe. … Time is simply the summation of spatial states – much like the frames in a film – occurring inside the mind. It’s just our way of making sense of things. There’s also a peculiar intangibility to space. We can’t pick it up and bring it to the laboratory. Like time, space isn’t an external object. It’s part of the mental software that molds information into multidimensional objects. For one thing, this idea is not really new. What if Time is a fourth dimension? How might we be able to watch events along the arrow of time before they have actually happened ? Can we double back and watch ourselves from a higher vantage point? Can we travel back in time and change the present? Etc, etc. I can’t expect that everyone who speculates about the nature of time has read Henri Bergson, but since Bergson proposed the (at the time) ultimate critique of existing time theories, it would be appropriate to see his theory acknowledged by a scientist who apparently wants to take the connection between natural science and philosophy seriously. In his day, Bergson was considered one of the greatest philosophers who ever lived. In 1889 he pointed out in his watershed of a book, Time and Free Will (and continued with his analysis in the 1896 book Matter and Memory), that time is misunderstood because we assume that it is quantifiable into spatial units (like the hands of the clock moving—through space). We are taken in by the brain’s predilection for externalizing and spatializing our experiences—but the true understanding of time is an internal flow, a duration which belongs to consciousness alone, and which has no equivalent in the spatial universe. As such, Bergson’s time concept may actually not be too far removed from Lanza’s—but for Bergson, time is not “the summation of spatial states” any more than it is like “frames in a film,” because that, in itself, is a spatialization. According to Bergson, we can’t “walk through time just like we walk through space,” and time is not “linear” in any directional sense. These are merely metaphors for the brain to cope with the experience of time passing, useful metaphors—but with no bearing on the lived experience of our life-time. Einstein himself engaged in critiquing Bergson, but he really didn’t get Bergson’s point. Of course this doesn’t mean that Bergson is right and Lanza wrong, but for Lanza to launch a philosophical theory of time, apparently bypassing Bergson’s theory (he isn’t even mentioned in the index of Lanza’s Biocentrism book) seems insufficient and incomplete. But most of these comprehensive theories fail to take into account one crucial factor: We’re creating them. It’s the biological creature that fashions the stories, that makes the observations, and that gives names to things. And therein lies the great expanse of our oversight, that until now, science hasn’t confronted the one thing that’s at once most familiar and most mysterious – consciousness. And that caught my attention at least as much as his time theory did—because this is right down my alley, viewing storytelling (narrativity) as the human invention of meaning, superimposed on a chaotic life. Indeed we are the story-telling animals, as Alasdair MacIntyre said. We tell the stories, we make the observations, and we name things. Absolutely. However, it would be a mistake to assume that we therefore create our entire universe through storytelling. We create stories and theories, right—but we don’t create the universe that the theories are supposed to explain—not all of it, at any rate. Postmodern perspectivism is wearing a bit thin: we may choose how we view our world, but we’re still stuck in (or thrown into) a reality that we have little control over. I am willing to concede that I may be jumping to conclusions, reading more into Lanza’s article than his book may actually claim (because I have not yet read his book), but judging from Lanza’s comments below the article it appears that he hopes the narrative angle can open up for the possibility of God’s existence, at least as a reality created (co-created?) by the storyteller. Those are fine ideas to bat around for philosophers—but I’d feel much better if a scientist would please leave philosophy of religion out of his or her professional, scientific theories.